Grand Theft Auto: San Andreas is an open-world, action-adventure video game developed by Rockstar North and published by Rockstar Games. 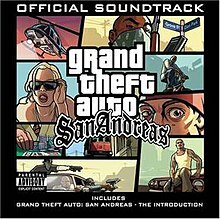 First released on 26 October 2004 for the PlayStation 2, San Andreas has an in-game radio that can tune into eleven stations playing more than 150 tracks of licensed music, as well as a talk radio station. The songs featured on the radio stations originated in the early 1990s, the period in which the game is set. Grand Theft Auto: San Andreas Official Soundtrack features selected tracks from the in-game radio stations. It was released as a three-disc album on November 23, 2004, by Interscope Records. The first two discs featured the songs, while the third disc is a DVD featuring The Introduction, a short machinima video depicting events prior to the game. ^ a b Erlewine, Stephen Thomas (23 November 2004). "Grand Theft Auto: San Andreas - Original Game Soundtrack". AllMusic. All Media Network. Retrieved 5 December 2015. ^ a b Empire, Kitty (December 12, 2004). "Helmet, Size Matters". The Guardian. Retrieved August 5, 2016. ^ Lopez, Miguel (23 November 2004). "Grand Theft Auto: San Andreas - The Soundtrack and Bonus DVD". GameSpy. Ziff Davis. Retrieved 5 December 2015. ^ a b Erlewine, Stephen Thomas (7 December 2004). "Grand Theft Auto: San Andreas [Box Set] – Review". AllMusic. All Media Network. Retrieved 5 December 2015. ^ D., Spence (7 June 2005). "Grand Theft Auto: San Andreas Official Soundtrack Box Set". IGN. Ziff Davis. Retrieved 5 December 2015. ^ Casey, Forest (December 14, 2004). "'GTA' box set compiles eclectic tribute to '90s". The Michigan Daily. Retrieved August 5, 2016. ^ Budgen, Simon Hayes (12 September 2005). "Various: Grand Theft Auto San Andreas". NME. Time Inc. UK. Retrieved 5 December 2015. ^ D., Spence (6 December 2004). "Grand Theft Auto: San Andreas Official Soundtrack Box Set - First Impressions". IGN. Ziff Davis. Retrieved 5 December 2015.